Want to enjoy the cozy comfort and warmth of your premises and wish the same for your family? 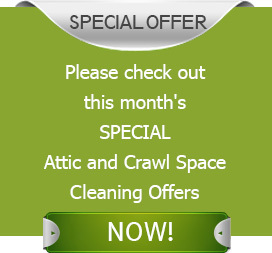 Simply keep your attic and crawl spaces in perfect shape. Ignored and unattended attic and crawl spaces are home to wide range of troubles. Seeping water, defunct and hampered insulation system and presence of pests and infestations; the list of hazards lurking in these areas may be endless. Failure to pay heed to these problems may turn disastrous. Evacuation, material damage, health implications and financial loss – the woes may seem unending. Regular inspection and periodic assessment is thus crucial. And no one’s better than Quartz Solutions! We are a team of trained and certified professionals. Equipped with the latest techniques in the business, we offer perfectly designed attic and crawl space services that meet your needs and budget in every way. Dust, odors, critters and other infestations may appear innocuous. But they flourish and multiply quickly posing serious risks to property and health. Dripping ducts let water and moisture to seep in. Damp and humid conditions attract mold, mildew and fungus to breed. They trigger wood rot, make the interiors stuffy and spur allergies and breathing troubles. Insects like spiders, wasps, ants, roaches, beetles and yellow jackets carry germs and spread dangerous infections. 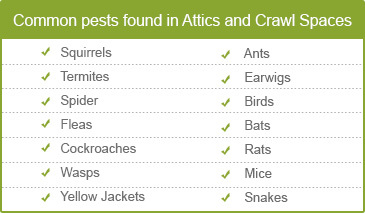 Small animals like squirrels, raccoons, mice and bats scamper in dark and dingy attics. They chew ducts, insulation wires, electric cables, upholstery and furnishings. Their stinky mess and remains is infectious. Pests, termites and carpenter ants eat into the wooden panels and beams causing severe damage to structure and foundations. Out-dated and damaged insulation system impairs the temperature control mechanism making the interiors extremely hot or cold. This results in substantial increase in utility bills. A thorough inspection and evaluation of the attic and crawl space is imperative for making premises safer, cleaner, more comfortable and fully functional. A close scrutiny that too by professionally trained crew is vital as important clues often go unnoticed by amateurs. And none other than Quartz Solutions can do the job best for you! Our skilled workforce will drop in for a scheduled preliminary analysis free of cost. We will look carefully for critters, cracked and broken ducts, leaking gases, impaired ventilation pipes and much more. Upon reviewing the condition, a best fit plan to restore the premises will be laid out. Dedicated, professional and competitive approach is what makes us stand out in the industry. Our custom plans are sure to fit into your needs and budget perfectly. Oradell, a small borough in Bergen County NJ, is home to nearly 8,000 Americans. Situated on the banks of the Hackensack River, Oradell is rated the ‘Seventh Best Place to live in Bergen County’. Vibrant views, serene surroundings, Oradell is home to affluent people and professionals. We too want to contribute to this wonderful community. Let us be your obvious choice for adding value to the area’s cleanliness quotient. Hire us to help you keep your attics and crawl spaces in perfect shape. Call us at 201-205-2042 are schedule your free pre-analysis today! My wife and I started to notice bad odors in our home. We traced the source back to the attic, so we called Quartz Solutions. After inspecting the property, the guy told us we had a moisture problem. He cleaned the space and installed a vapor barrier, which solved the problem. Great people to work with! !